Dive into Swift 3, the latest version of Apple’s easy-to-use programming language for macOS, iOS, watchOS, and tvOS. 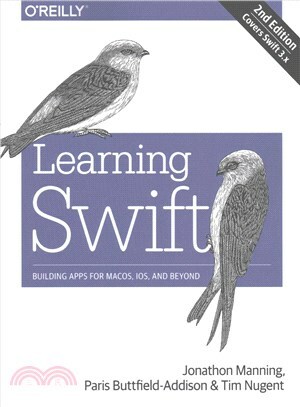 With this practical guide, you’ll quickly get up to speed on language basics and then use Swift to build three complete apps, all tightly linked together: an iOS note-taking app, its OS X counterpart that uses iCloud to sync data, and an app for the Apple Watch that makes the user’s data available at a moment’s notice. You’ll learn not only how to write code in Swift, but also why Swift works the way that it does, and how to build upon its foundations. Then you’ll explore Swift in the wider world, including open-source frameworks that your apps can use, how to use app extensions make your app play nice with other apps, and how to take Swift beyond Apple’s domain with open-source Swift tools.